My research centers on the preconditions of monetary exchange, the practice of monetary policy, and their relevance to social cooperation. In press – Eastern Economic Journal. A challenge for quantity-theoretic explanations of business cycles is that recessions manifest despite central banks’ scrupulousness to avoid falls in monetary aggregates, a fact which would seem to indicate a structural explanation. This paper argues that a broader and theoretically richer Divisia aggregate – which reflects changes in financial market liquidity even without changes in the quantity of any particular asset – can reconcile these two approaches. Liquidity shocks such as the rise and collapse of asset bubbles can drive excess supply of and demand for money, respectively, that quantity theorists point to as determinative of short-run economic fluctuations. August 2018 – Journal of Institutional Economics, 14(4): 689-714. This paper offers an increasing returns model of the evolution of exchange institutions building on Smith’s dictum that “the division of labor is limited by the extent of the market”. Exchange institutions are characterized by a tradeoff between fixed and marginal costs: the effort necessary to execute an exchange may be economized by up-front “investment” in strategies to facilitate the publication and accounting of trading histories. Increases in the size of the exchange network select for higher-fixed-cost exchange institutions, beginning with autarky, through various intermediate stages, and finally to mass monetary exchange. 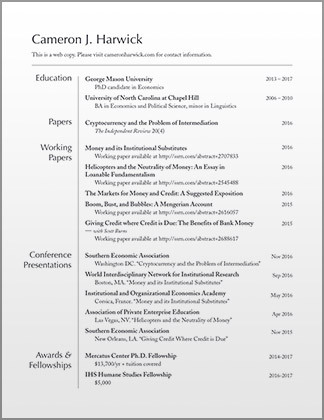 By identifying the relevant fixed costs of money and its institutional substitutes across time, the paper both accounts for the persistence of premonetary exchange institutions, despite the “inevitability” of monetary exchange that seems to be a feature of traditional models of the origin of money, and illuminates the forces driving the transition from one to another. Spring 2016 – Independent Review, 20(4): 569-588. Though Bitcoin currently enjoys a healthy niche, the aspirations of many in the project are grander: to supplant the existing regime of fiat currencies with cryptocurrencies, and to do so outside of normal political channels. Its primary practical obstacle is its purchasing power volatility, arising from a rigid money stock in the face of wide swings in demand. Nevertheless, the historical example of gold, another (much more successful) money commodity with a more or less rigid supply, illuminates the institutional prerequisites for purchasing power stability, economic efficiency, and sustained growth – namely a market of financial intermediaries whose liabilities denominated in the base money themselves circulate as media of exchange. This paper discusses potential benefits and hurdles to establishing financial intermediation in cryptocurrency, as well as the possibility of managing the money supply to create a stable purchasing power cryptocurrency without the need for intermediation at all. Such schemes ultimately require an existing market of intermediaries in order to provide any benefits, the emergence of which governments are for the moment well-positioned to prevent. Models of monetary expansion, following Friedman (1969), tend to abstract away from the relative price effects of monetary policy by assuming that the central bank distributes money directly to agents via helicopter. However, in light of the recent entertainment of helicopter drops as a potential monetary policy tool, this paper argues that it would be a mistake to conclude from such models that actual helicopter drops are relative-price neutral. Indeed, they are likely to be significantly more distortive than open market operations, a fact obscured by the representative agent construction used in the standard cash-in-advance construction. This paper develops a computational heterogeneous-agent model to compare the relative price effects of helicopter drops and open market operations, and to avoid the inability of the standard cash-in-advance model to account for persistent wealth effects. The results highlight the key role of financial systems in distributing changes in the money stock with minimal economic disturbance. The notion of savings in economics has a variety of mutually incompatible meanings. This paper goes through various interpretations of the term and argues that, for the sake of clarity, it can and should be replaced with more precise terms. In order to show the significance of doing so, the paper then offers an “augmented” loanable funds model. Unlike the standard model, which was developed in the context of unintermediated lending, our model 1) does not identify the supply of loanable funds with “savings”, and 2) explicitly connects the banking sector to the supply of money with something more theoretically robust than a simple money multiplier. The resulting construction clarifies the relationship between the markets for money and credit, and is more faithful to the image of banks as creators of credit, while still retaining the pedagogical simplicity of the original loanable funds model. The impossibility of constructing totally incentive-compatible institutions, whether organizationally or politically, implies the necessity of something like what has traditionally been called a “noble lie”. 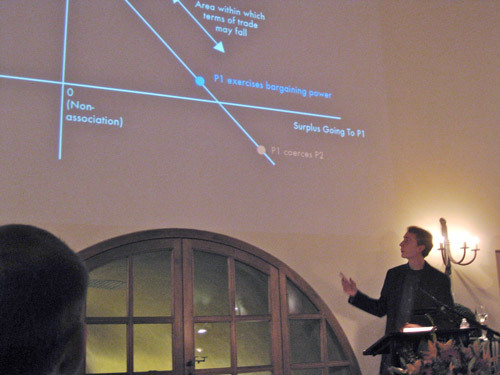 Drawing on the theory of cooperation, the paper argues that viable social organization requires a systematic divergence between subjective preferences and objective payoffs. This implies the existence of irreducible and irreconcilable “inside” and “outside” perspectives on social institutions; that is, between foundationalist and functionalist approaches, both of which have a long pedigree in political economy. The conflict between the two, and the practical impossibility of dispensing with either, poses a challenge for an ethical institutional economics. Economists have long debated the relationship of bank credit to the business cycle. The attribution of economic cycles to the “inherent instability” of private bank money has been advanced by a number of prominent economists throughout history including Irving Fisher and University of Chicago icons like Frank Knight, Henry Simons, and a young Milton Friedman. The recent financial crisis has reignited these calls to abolish fractional reserve banking through “narrow banking” or “sovereign money” proposals. This paper rejects this notion and argues that the “pyramid of credit” plays a fundamental role not only in stabilizing economic activity but also in fostering economic development. The instability commonly attributed to pyramiding can be largely mitigated by policy changes far less drastic than the abolition of bank money, and any residual instability is almost certainly worth the dramatic benefits in normal times.